Security is a two-step process whose goal is to prevent a user from accessing a resource that he/she should not have access to. All URLs not matching /admin/* are accessible by all users (and the user is never prompted to login). When a user makes a request to a URL that's protected by a firewall, the security system is activated. The job of the firewall is to determine whether or not the user needs to be authenticated, and if he does, to send a response back to the user initiating the authentication process. In this example, the user ryan successfully authenticates with the firewall. But since ryan doesn't have the ROLE_ADMIN role, he's still denied access to /admin/foo. Ultimately, this means that the user will see some sort of message indicating that access has been denied. You will not need to implement a controller for the /login_check URL as the firewall will automatically catch and process any form submitted to this URL. It's optional, but helpful, to create a route so that you can use it to generate the form submission URL in the login template below. Notice that the name of the login route isn't important. What's important is that the URL of the route (/login) matches the login_path config value, as that's where the security system will redirect users that need to login. First, be sure that you've defined the /login and /login_check routes correctly and that they correspond to the login_path and check_path config values. A misconfiguration here can mean that you're redirected to a 404 page instead of the login page, or that submitting the login form does nothing (you just see the login form over and over again). 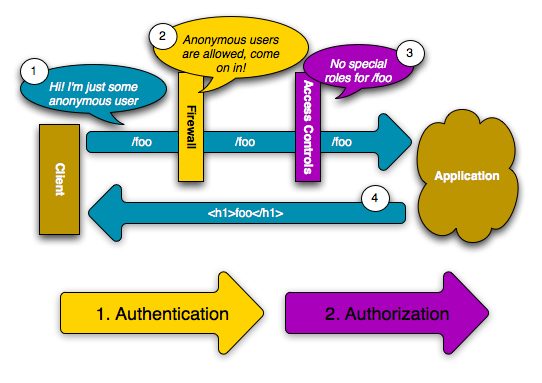 The first step in security is always authentication: the process of verifying who the user is. With Symfony, authentication can be done in any way - via a form login, basic HTTP Authentication, or even via Facebook. 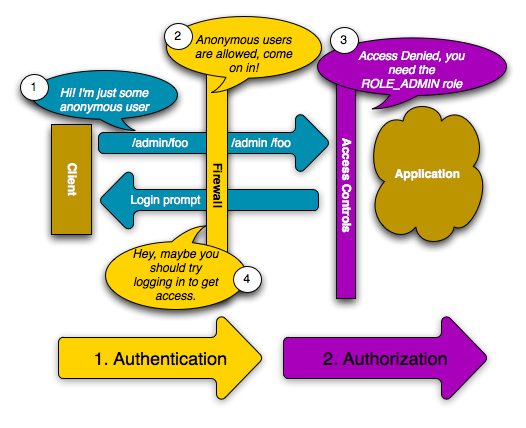 Once the user has been authenticated, authorization begins. 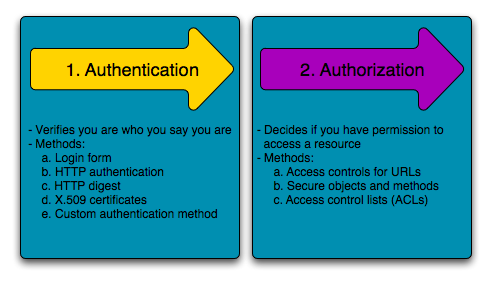 Authorization provides a standard and powerful way to decide if a user can access any resource (a URL, a model object, a method call, ...). This works by assigning specific roles to each user, and then requiring different roles for different resources. 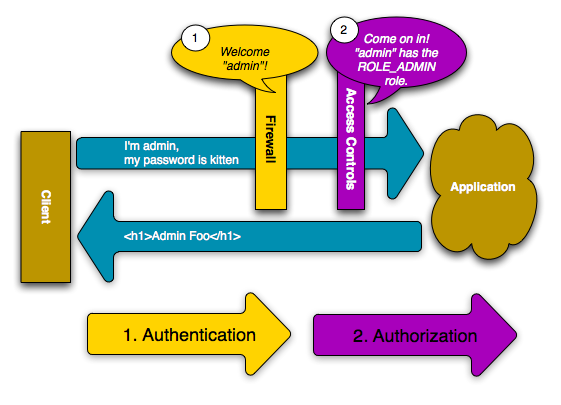 Understanding exactly how access_control works is very important to make sure your application is properly secured. 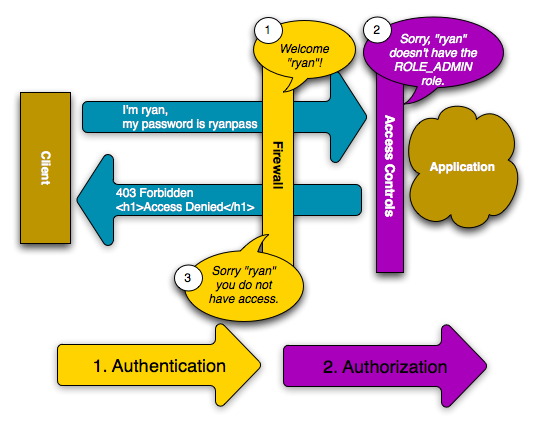 See Understanding how access_control works below for detailed information. Since Symfony 2.0.20/2.1.5, the Twig render tag now takes an absolute url instead of a controller logical path. This fixes an important security issue (CVE-2012-6431) reported on the official blog. If your application uses an older version of Symfony or still uses the previous render tag syntax, you should upgrade as soon as possible. Imagine you are designing a blog system where your users can comment on your posts. Now, you want a user to be able to edit his own comments, but not those of other users. Also, as the admin user, you yourself want to be able to edit all comments. The user object will be serialized and saved in the session during requests, therefore it is recommended that you implement the Serializable interface in your user object. This is especially important if your User class has a parent class with private properties. In this case, you're using the stronger sha512 algorithm. Also, since you've simply specified the algorithm (sha512) as a string, the system will default to hashing your password 5000 times in a row and then encoding it as base64. In other words, the password has been greatly obfuscated so that the hashed password can't be decoded (i.e. you can't determine the password from the hashed password). In this example, if a user tries to login via HTTP authentication, the authentication system will use the in_memory user provider. But if the user tries to login via the form login, the user_db provider will be used (since it's the default for the firewall as a whole). For more information about user provider and firewall configuration, see the Security Configuration Reference. Once the user has been logged out, he will be redirected to whatever path is defined by the target parameter above (e.g. the homepage). For more information on configuring the logout, see the Security Configuration Reference. href="<?php echo $view['router']->generate('homepage', array('_switch_user' => '_exit') ?>"